Pumpkin spice cookies are a great way to celebrate fall! One of my favorite things about fall is the abundance of winter squash and pumpkins at the farmers market. They’re such an awesome food – they grow very abundantly in most gardens, they store extremely well, they can feed a lot of people, and they are a welcome ingredient in most vegetable recipes. 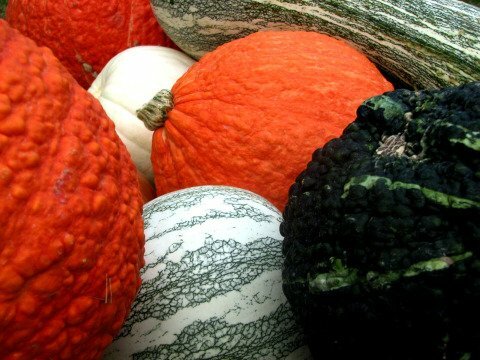 Squashes and pumpkins are an important part of most local-food centered diets, because they can be kept for a long time in cool storage, meaning fresh food for you in the winter. Buy cases of squash in the fall and store them to stretch your food budget and stock your pantry with nutritious goodness. When we go to the farmers market during the fall harvest season, we make sure to stock up on pie pumpkins, butternut, red kuri, acorn, and spaghetti squash. In the fall and winter, we have squash several times a week, and with four of us eating (and one nursing), one large squash only lasts for one meal, so we stock up on them. This year, we’ve been eating a locally grown traditional Hopi squash, and our neighbor gave us a Hungarian Finger Fruit squash – a kind of bizarre looking white squash with little finger-like projections along the sides. Random squash factoid: The squash fruit is classified as a pepo by botanists, which is a special type of berry with a thick outer wall or rind formed from hypanthium tissue fused to the exocarp; the fleshy interior is composed of mesocarp and endocarp. The pepo, derived from an inferior ovary, is characteristic of the Squash Family. Most of the squash we buy go into savory dishes, like a stir-fry or soup, or vegetable burritos, and the rest go to feed my sweet tooth. Most people love zucchini bread and pumpkin pie, so I figured what the heck, how about a pumpkin cookie? I thought to myself that if I could only discover the perfect pumpkin cookie recipe, it would be one giant leap toward world peace (because who doesn’t love dessert?). So I followed my humanitarian ideals in order to discovery for the world if a truly fantastic pumpkin cookie was really possible. Finally, after years of baking and tasting and recipe-tweaking, I’m proud to be able to share this pumpkin spice cookie recipe with the world. I call them Ridiculously Good Pumpkin Spice Cookies, and they are now the standard for fall desserts at Natural Papa headquarters. Not only are they delicious, but this fabulous recipe will have you eating tons of pumpkins and squash long before the traditional Thanksgiving pumpkin pies. Oh yeah, they’re also vegan (if you must have your eggs, add two liquid chickens eggs instead of the egg replacer). Pumpkin always makes me think about fall. Great recipe! .-= Stephanie´s last blog ..Trash Becomes Treasure in Trenton NJ =-. .-= biofriendlyblog´s last blog ..Hydrocarbons Polluting the Air We Breathe =-. mmm… I love cookies of any sort. My wife’s been making a really great butternut squash soup lately that’s totally awesome. Let me know if you want the recipe. .-= Testosterblogger´s last blog ..NFL Week 1: My "expert" analysis =-. Wow that’s a great use of pumpkin. Mind if I reprint your recipe in my healthy snacks section with a link back? Of course, I am baking them tomorrow. .-= Olga´s last blog ..Sep 9, Health benefits of kale =-. Please feel free to reprint it, and just link back to this post – enjoy! Oh. My. Gosh. These cookies are amazing! They are so good I honestly can’t believe it. I have no fear of incorporating garden bounty into any dish, sweet or savory, so I thought “pumpkin cookies? yes!” as soon as I saw this on Twitter (thanks to GreenBizTweets for posting it). So I made these yesterday, and due to lack of planning, didn’t have time to bake, and so they actually chilled for about 20 hours instead of just one. So when I baked them tonight, I had to bake longer (more like 14 minutes). I was expecting a tasty, but dense chewy sort of cookie. But oh no! Joy of joys! They are spicy and just the right amount of sweet and flavor, and yet light like little pillows! Like little pumpkin pie pillows. So I don’t know if it was because I used two real chicken eggs, or because they chilled for so long or if your recipe is just that genius, but they are so puffy and soft and light and perfect that I may be using ALL my winter squash on this recipe. Thank you SO MUCH for experimenting and sharing. I’d love to make these cookies – I have a friend who is strictly Vegan. I’m a bit confused (and embarrassed, as well) what is the egg replacer you’re writing about (?) the cartons on the grocery shelf called egg beaters, or whatever they’re called? I thought those had some egg product in them. My friend doesn’t eat eggs/dairy, or anything with a face! Carole – We use Energ Egg Replacer for these. It can usually be found at a natural foods store/co-op. You can also use ground flax seed, but this makes for more consistent results, I think. That’s a great looking recipe, Derek, thanks for sharing. I also love to prepare Japanese pumpkin called kabocha. It’s smaller in size, with bright orange, fiber texture inside. It’s quite moist, tender, and very juicy when you broil them, and quite sweet like yams. These sound wonderful! Normally not much of a cookie person, I just love a good pumpkin cookie – however, I may just have to try it with butternut squash first. That really must be an interesting and delicious cookie! I love pumpkins, especially when fall’s coming soon! These are amazing. So simple and delicious. Its like pumpkin pie in the form of a cookie! Thanks for the awesome recipe. I will definitely be making these again soon…seeing as half the batch is eaten already! I suppose they would also be delicious with some of the wonderful hard shell fall squashes. I love a recipe that has no eggs you have to scrabmle to substitute! I’d love to guide Foodista readers to your site. I hope you could add this pumpkin spice cookie widget at the end of this post so we could add you in our list of food bloggers who blogged about pumpkin spice,Thanks! I love this idea of pumpkin spice cookies. Too many people just embrace the “pumpkin concept” only on Halloween. But I can’t have great Pumpkin treats just one day a year. Thanks for the cookie recipe. Keep ’em comin! What a fabulous recipe and definitely a healthy way to snack. Pumpkin spice cookies..now that is a great way to get your antioxidants! Pumpkins are definitely one of the most favorite veggies by most people. I am personally amazed on how it can bring a lot of variations and tastes. They simply make the most delicious meals in every occasion I know. But I must say that the pumpkin creamy soup is always a favorite of the family. This coming Halloween, I am planning to go on a pumpkin shopping again, and I can’t wait to try the pumpkin cookies recipe we have here. I hope my kids won’t notice the main ingredient on it, though. I am also planning to give it out to trick or treaters. Let’s Go Pumpkin Shopping! Could you freeze some of the dough to bake later? Has anyone tried this? i’m making these for a thanksgiving celebration at my kids pre-school. so, i replaced the nuts with dried cranberries. i used ground flax as the egg sub because that’s my preferred method. if the raw dough is any indication these will be amazing. thanks! All I can say is WOW! I baked a batch of these (using real maple syrup) and just could not get enough of them! Right from the oven when they are a little warm, they are like a soft little pillow of heaven! My daughter also tried these and we are now both hooked. Thanks for sharing!